I love Christmas. Something about the hope and the sparkle and the magic, as well as the foundational meaning, touched my heart as a lonely little girl with a broken family life—and it never left me. Even though the holidays have created additional work and stress as our family has grown (and grown), the good things about the season still feed my soul. I still love the atmosphere, the music, the lights, the trees….how about you? Christmas isn’t just one day, it’s a whole season. 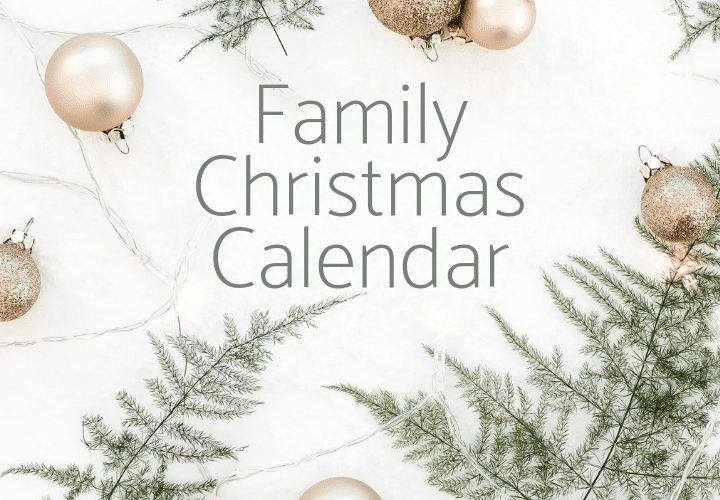 With that in mind, I’m sharing part of our December calendar for traditions and events in the hope that it will give you some ideas to celebrate the season or create new traditions with your loved ones. All of these activities and events are scheduled for specific days and times on the calendar (just didn’t want to publicly post when we’d be gone). 🙂 The thing is, we can have an idea floating in our head about things we want to do before Christmas….but unless they go on the calendar there’s a good chance they won’t get done! We even had a family calendar meeting to coordinate and make sure everyone is aware of what’s scheduled. It’s possible that things will come up and we won’t be able to do All The Things, but I bet a lot more WILL get done because activities were chosen and scheduled. 1 – Break out the chocolate Advent calendars for the daily countdown! 5 – St. Nicholas Day Eve: put grass or hay-filled shoes on the hearth before bed, with your Christmas list tucked inside. Wake up the next morning to chocolate coins and a tiny gift. 13 – St. Lucia Day: girls wear white nightgowns and bring parents coffee and pastries in bed. Candles are a must! week before Christmas – Take a drive to look at Christmas lights, with popcorn and hot chocolate to go! 23 – Family begins arriving by car and plane for Christmas! It’s our “on” year for Christmas and ten of our children and their families will be home! 25 – It’s Christmas! Open stockings and “Santa” gift when little ones wake up, eat breakfast, open the rest of gifts. Stay in pajamas, snack, watch Christmas movies and play with new gifts all day. Big Christmas supper: brisket, mashed potatoes and gravy, rolls and more. Enjoy every minute of being together! Remember, the point is NOT to fill up your calendar with places to go and things to do. It’s to decide what you’d like to do to celebrate the season, then make sure that happens and doesn’t get forgotten in the hustle and bustle. Maybe this is a year to stay home (a lot) and keep things super simple. I had foot surgeries right before Christmas the last two years in a row, so I’m thrilled to get to do more activities this year. Make the activities and the calendar fit YOUR life and your family (and your season of life). Happy planning and even happier Christmas season to you and yours!